It goes without saying that over time dumpster pad areas can become filthy and unsightly. That is why routine dumpster pad cleaning is imperative for your business. Not only are unkempt dumpster pads an eyesore, but also generate numerous health risks for your staff and patrons. Below are a few reasons to have your dumpster pad professionally cleaned on a routine basis. 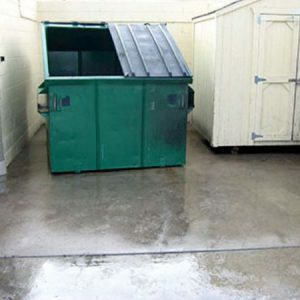 Over time, garbage buildup and spills will make your dumpster pad unappealing to visitors. The end result being your property will appear littered and neglected, greatly impacting that positive image your business strives for. The longer the problem is ignored, the worse it will get. So regular dumpster pad cleanings are a necessity. We all know garbage is a breeding ground for rodents, insects, and hazardous bacteria. Discarded food and leaked liquids attract all kinds of pests including flies and other unwanted insects. Parasites and bacteria can quickly spread on your employees’ or customers’ hands and clothes which is a huge health concern. Not to mention, discarded boxes and empty containers can attract rats or mice that could easily spread disease. As mentioned above, bacteria and disease-spreading rodents can have a huge impact on the health of your employees and clientele. But another hazard to take into consideration is harmful slips and falls due to leaking liquid and grease spills around your dumpster pad area. You could be held liable for accidents on your property due to unsafe conditions, so it’s important to schedule a routine cleaning to avoid such risks and facilitate a safe environment for your staff and customers. Overall, maintaining a safe and clean dumpster pad will boost your curb appeal and show your customers that you take pride in your business. Also a clean and well-maintained dumpster pad area will have a positive impact on the health and morale of your employees, which is also good for business! Contact Skiles Industrial Solutions today to schedule a dumpster pad cleaning for your business.